At this day and age it’s not unusual to be using multiple computers at once – one desktop at home, another at the office, a laptop, a tablet computer, even a mobile phone. But it can be quite tiresome to have to back up or synchronize all your folders and files from these computers – regardless of whether you’re using a USB disk, an external hard drive, or a stack of blank CDs. Sure, E-mailing the files to yourself might be a pretty cool idea (since everything is stored online), but when you’ve done it more times than you can take, and when attaching files takes more time than you actually have, it’s a definite sign that you should be looking for a better solution. Enter Dropbox – a service for automatically syncing, storing, and sharing files online. Launched in late 2008 for Windows, Linux, and Mac, Dropbox makes it simple and easy to access your documents from anywhere, from whatever computing device you’re using. The service is based on cloud computing technology, which also means that all the data from these documents are backed up on the Web, on remote, encrypted servers hardened against attacks from hackers. Dropbox works like Google Docs, except that it isn’t just limited to word processing documents, spreadsheets, and PDFs. You get started by registering an account for free (which comes with 2 gigabytes of storage) and installing the client on each computer you’re working on: laptop, desktop, office computer, mobile device, what-have-you. 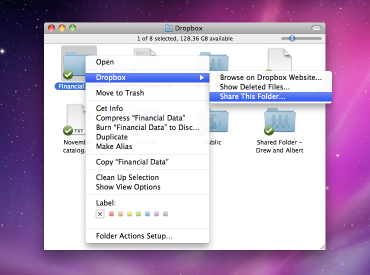 Dropbox then creates a folder for placing files – or more folders, containing files – that you can access from any other computer or Internet browser. Whenever you make changes to these files and folders, Dropbox automatically updates them (in a matter of seconds), so that wherever you are, as long as you have access to the Internet, you’re carrying your files with you. Even if you lose – knock on wood – your iPhone in a cab or break your laptop, you’ll still be able to retrieve those files using any other computer, via your Dropbox account or folder. If you need more than 2GB worth of free storage, Dropbox offers Pro plans that start at $9.99 a month. For an additional 10 bucks – or 19.99 monthly – you can get as much as 100GB worth of storage – with all your files backed up, synced, and stored online. There’s also a referral system in which you can earn extra storage for recommending the service to your friends and colleagues. Dropbox has other impressive features that make it worth the switch from Google Docs. Apart from the ability to seamlessly sync and store all kinds of files, Dropbox has the advantage of easy file sharing – using shared folders inside the main Dropbox folder to allow several other people to collaborate on a set of files. Here at Lakeshore Branding, we’ve found this feature to be quite useful, especially for transmitting, updating, and sharing documents to our outsourced staff on the other side of the world. All they would have to do, really, is click a link that grants them access to our shared files and folders. Dropbox, moreover, keeps a history of all the revisions made to any file, so that if you regret a change you have made to a Word document or a presentation, you can always go back and recover any of their previous versions. For on-the-go users, Dropbox offers free apps for the iPhone, Android, BlackBerry, and iPad. No more having to transfer files via Bluetooth or USB before you take off for a meeting. No more E-mailing yourself. It’s cloud computing at its simplest, and for its excellent syncing, sharing, and storage abilities, Dropbox is definitely worth signing up for. DROPBOX.COM is worth a try in any case! I’m fully satisfied with this service. It has a wide range of functions and it’s free for the 2GB variant. Free and if you like anonymous registration with a free upgrade possibility up to 8GB.